The iconic tracks have been temporarily shuttered for the building of Star Wars Land. 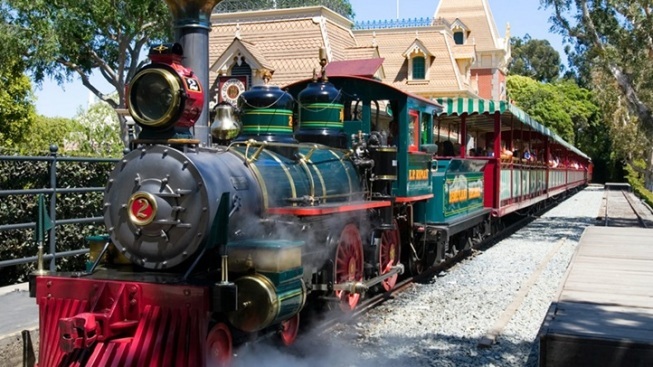 Toot-toot: Disneyland's famous trains will again be on the move in the summer of 2017. The attractions on the Rivers of America will also start up again after a year-plus closure. When one strolls inside the gates of Disneyland, one can count on seeing a few permanent, park-iconic sights. The giant flower Mickey has been a part of the entrance area since Disneyland's early days, and the sign beginning "Here you leave today..." have long set the stage for the experience to come. But spying a train at the entrance has been a "maybe, maybe not" thing for years, given that trains do move. Everything changed, however, in January 2016, when the Disneyland Railroad temporarily shuttered as construction on Star Wars Land began near the back of the theme park. The trains took up permanent residence at Main Street Station and New Orleans Square, waiting for the time when they'd be called upon to again toot-toot down the line. That toot-toot time will arrive in the summer of 2017, Disneyland Resort revealed on Thursday, July 28. Likewise, the attractions of the Rivers of America — the Mark Twain Riverboat and the Sailing Ship Columbia — will also return to service at that time. And, yes, dragon devotees — Mickey Mouse and company will again be presenting "Fantasia" nightly, complete with pyrotechnic effects and thrilling ship-based shenanigans. Look for the return of the Pirate's Lair at Tom Sawyer Island and the Davy Crocker Explorer Canoes, too, next summer. Will there be changes to the Rivers of America area? You bet. Look for "an elevated trestle" and "a gorgeous new riverbank" to be part of the fresh look. As for exploring the trains in-depth, from their literal bells and whistles to how they operate? That's been a perk of the temporary closure, as engineers and cast members stood by to answer questions and show train buffs around the steam engines' mechanisms. Once the trains are running again, that show-and-tell won't be quite as relaxed or at-your-own-pace, save a question or two while you're riding. Best check 'em out before the summer of 2017, if you want to do some lookie-loo-ing. And when will Star Wars Land open? That's still a few years off, with no firm debut date. But a current trip on Big Thunder Mountain Railroad provides a few quick peeks into the construction area, and the AT-AT Walkers and TIE Fighters — er, the backhoes and heavy equipment — look quite busy, indeed.